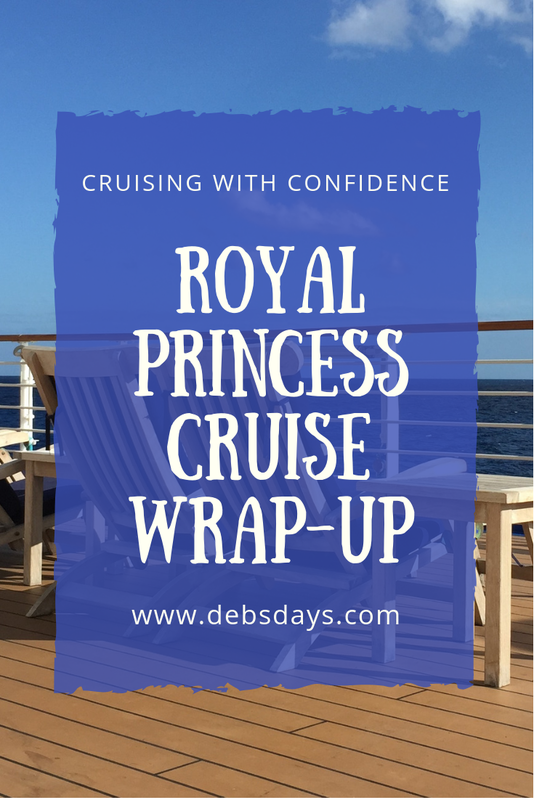 We had a great week on the Royal Princess and always love this itinerary. There were so many good things I don’t know where to start so I’ll just jump right in. We loved, loved, loved the choices at the buffet. I think we even ate less on this sailing because there were so many options that we could find something we liked right away. (It seems like on other ships when the choices aren’t that great we would choose one thing, then not like it and go back and get something different.) Our appetites were whetted first time around on this ship. We always ate outside behind the buffet in the section of the ship called Horizon Terrace. Fresh air, nice views, and outstanding service. Servers were frequently swinging by to check on drinks. Sometimes I’d walk over to get some ice water and they catch me before I even made it there and would grab my drink for me. The buffet coffee is fresh ground, not from syrup, so hubby never had to once use his coffee card to get a good cup of coffee. Here the silverware is also in a holder on the table. This is the third consecutive ship I’ve seen it on so I do hope it’s something Princess is doing on all ships. So much more convenient than having to pick it up in the buffet line or having it placed on the table itself where passengers would occasionally take away a fork or spoon or knife, leaving an incomplete set. While we love Alfredo’s, we ate there just twice this trip. Remember, you don’t have to order just from the menu. If they have the ingredients, they will make you the pizza you want. We typically share a pepperoni, extra cheese, and garlic pizza. Always tasty. We absolutely loved the location of our cabin. It was at the back of the ship and was super quiet. We used the aft elevators that took us right up to the back of the buffet and the Horizon Terrace seating. We felt like someone was trying to play a trick on us because we had another dud of a cabin steward. I swear our last one called this guy up and gave him instructions on what to do (and not to do): Don’t introduce yourself; don’t greet the passengers; do walk in unannounced; don’t clean the cabin when the make up room sign is out. By the second day things were so bad we had to contact the supervisor. Just look at this mess on the balcony we found when we arrived. How do you miss something like this and not clean it up until the supervisor tells you to? After the supervisor was involved it got better for about a day and a half. Then it went back to the not-so-great way. I won’t go into details on all the negatives, but on the plus side he did keep us supplied with ice. The level of service we’ve received from cabin stewards on the six ships we’ve been on so far this year has varied so wildly, I sure would have loved to interview the head of housekeeping to get an idea of what exactly a steward’s duties are. Not to complain, but just to get a better understanding of the expectations fleet-wide. We liked having the sofa in the deluxe balcony. It had a firm cushion so it was easier for hubby to get up out of it. Of course, once the balcony got clean it was nice as well. We also liked the big bathroom sink that the Royal Princess has. We did laundry by hand and having the extra room certainly made it easier to do the washing. The Wake Show was filmed in Princess Live but no passengers were allowed to sit in on the taping at all. Didn’t make much sense to me. Why have it in a studio if people can’t watch it in person? On the second formal night a group vow renewal was held in the Piazza. Participants even received a certificate. On both sea days there were weddings held on the aft part of the Lido deck, in the Horizon Terrace section. I have to be honest here…I didn’t look at the Patter much, other than to find if any crafting sessions were happening around the ship. The only arts and crafts session happened on the last sea day. 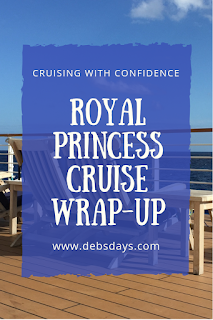 There were a few things against me going – the most traveled guest luncheon rolled into us going shopping to use up our nonrefundable onboard credit, which then placed us back in the cabin with little time to spare for me to change clothes. Plus on the Wake Show the cruise director made a weird comment about the flower making craft. I couldn’t tell if he was making fun of whoever wanted to go or was making fun of the craft itself. Since I’m totally against doing anything that might embarrass me, I didn’t rush to change clothes and missed the crafting session. The entire cruise was spent either eating breakfast or dinner (we skipped lunch) on the Horizon Terrace, sitting on our balcony, watching the on-demand movies, or in port. We never went to the dining room, saw a show, hung out at the pool, drank in a bar, went into a shop (until the last day when we realized we had some nonrefundable credit that needed to be used up), or visited the casino (other than to use the ATM to replenish our cash for the next leg of our trip). At the guest safety assembly (muster drill) the big monitors between the elevator banks showed important information for those needing to know where to go. There were some familiar Ocean Medallion faces onboard. We had sailed with some of them during the roll on out the Caribbean Princess. This cruise they were doing some filming. This ship is going into wet dock (as opposed to dry dock) starting today. I can’t confirm what kind of Medallion work they will be doing onboard, but hopefully they will be working on MedallionNet. The internet this voyage really was bad. It dropped quite often and it took forever to load. Then other times it was quite decent. I thought it was bad on the Crown transatlantic voyage, but for me it was worse here. Part of wet dock will be replacement of mattresses, but I wonder if they will be replacing TVs, too. The reason I mention that is one day this week there were several TV boxes in the hallways. I doubled checked the boxes and they were heavy so they definitely had TVs in them. We would have been just fine staying on this ship for several more weeks, but with the wet dock happening we knew we couldn’t. So that’s why we decided to head to San Francisco to join the Grand Princess on December 3. We are going to see a couple dear crew members we consider family. Two cruises on the Grand will be a great way to wrap up our year of cruising. See you Monday on our last ship of the year!